If there are two things that truly characterize a New Yorker, they would entail an enthusiastic pride for the food in this city as well as some strange, high tolerance for waiting in lines. 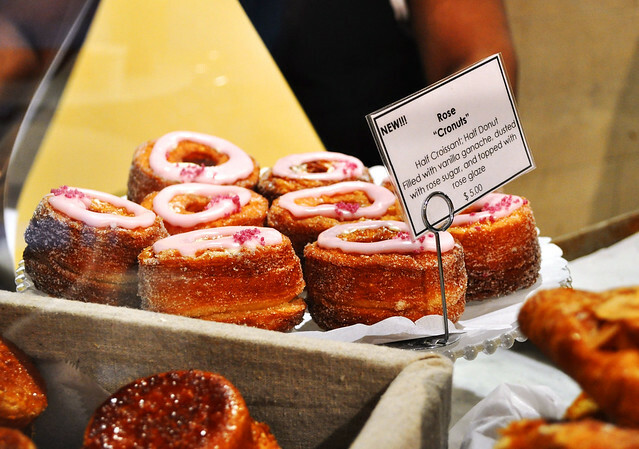 So it would be no surprise that these said New Yorkers would make crazy early beelines for something like the Cronut, an ingenious creation by Chef Dominique Ansel that is a resulting hybrid of part croissant and part doughnut (thus, Cro-nut). 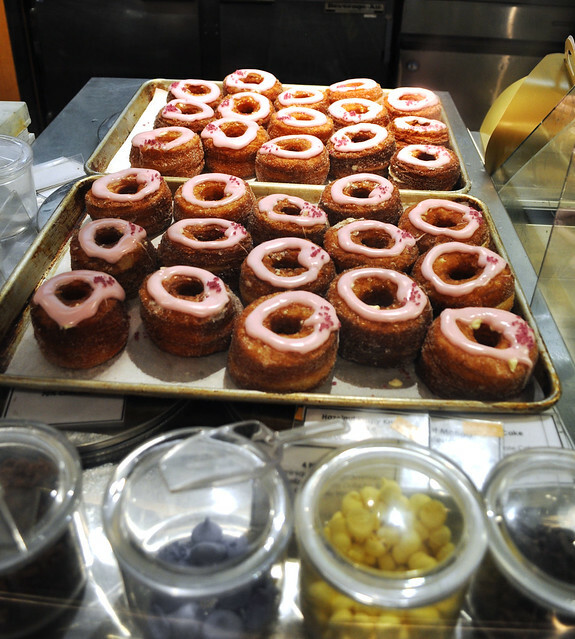 Making its debut barely two weeks ago, the Cronut can be found at Dominique Ansel Bakery (DA Bakery) over in SoHo, where it has been selling out daily before noon. Derek had gone there the day before we did, and he gave us some insight on the line. He arrived around 7:30-7:45, where he stood in line behind twenty or so people. He got really lucky -- Derek was able to buy one of the last ones (! 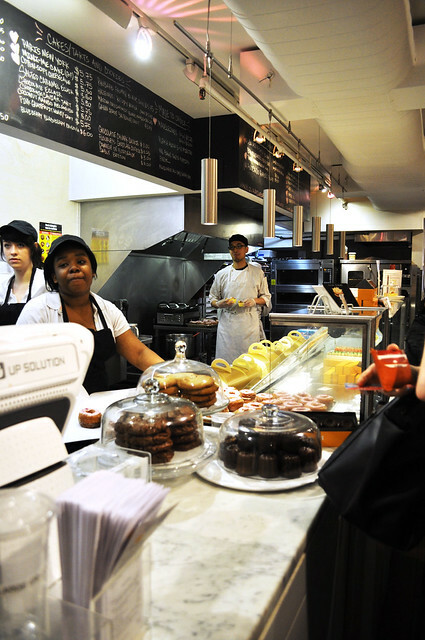 ), as DA Bakery makes roughly 200 daily. 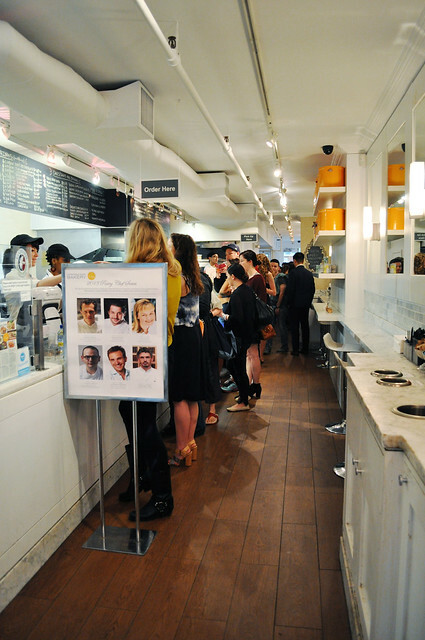 That meant Cronuts were sold out before 8:30 that morning. With that being said, Marcus and I had to devise a full-proof strategy to ensure we'd score some Cronuts. The bakery opens at 8 AM daily (except at 9 AM on Sundays), so we aimed to be up before 6 AM, leaving our apartment shortly after to get to the bakery around 7-7:15 AM. If there's one thing that can get me out of bed so freaking early in the morning, it's a damn good pastry. We really hoped the recent developing hype was a genuine indicator that they were really just that good. That morning, we got very lucky, too -- given the good subway karma we got on our ride down to SoHo, we made really good time and got to the bakery a little before 7 AM, where we found only one person in line already. However insane it was, getting there an hour before made us a comfortable second in line. Phew! Growing up near the north of Paris, Chef Ansel began his formal culinary training at 16 years old, an aspiration inspired by his father, Dominique Ansel, Sr. His career began at Fauchon, the "legendary French pastry institution" in Paris. Here, he spent seven years "traveling the world to open shops in places ranging from Egypt to Russia to Kuwait." Chef Ansel put his name on the map in New York City during his six-year tenure as executive pastry chef for Restaurant Daniel, Chef Daniel Boulud's flagship restaurant. 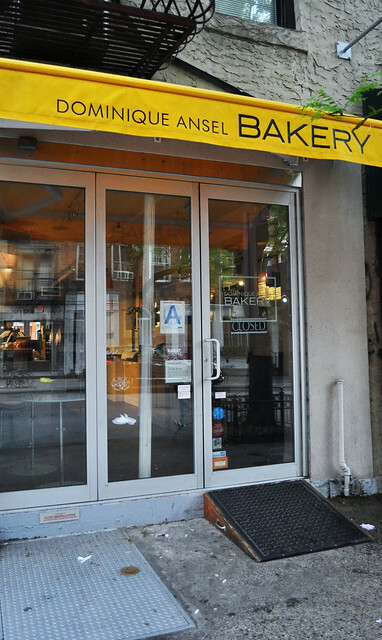 After his time at Daniel, he opened his own bakery (i.e., Dominique Ansel Bakery) in November of 2011. In 2013, he was nominated for a James Beard Award for Outstanding Pastry Chef. Once the doors opened at 8 AM, we were instructed to queue up at the register, following the line back towards the rear of the restaurant where the garden/greenhouse is located. There they were, in their gloriously fried and buttered beauty. 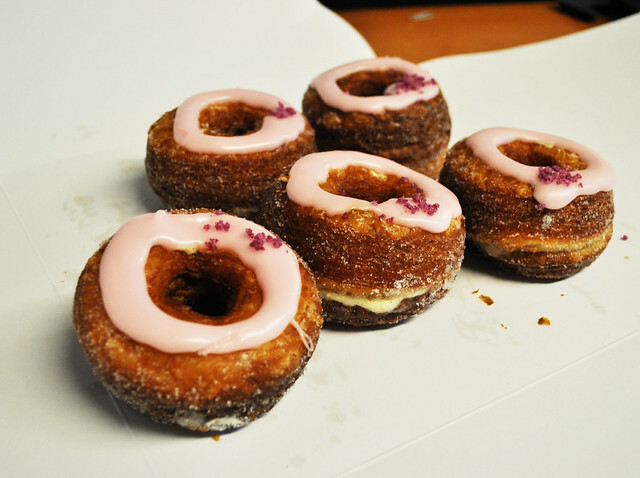 The inaugural flavor were rose Cronuts -- deep-fried layers of croissant dough filled with vanilla ganache then dusted with rose sugar and topped with a rose glaze and candied rose petals. Chef Ansel has said to expect a flavor change in the next couple weeks -- rumors are that the next flavor will be lemon maple in June and dulce de leche in July. Trays of Cronuts ready to be sold and wrapped up for the patrons who patiently waited in line that morning. Just as a heads up, the policy now limits six Cronuts per patron. The counter at DA Bakery. Derek actually told me that now one of the pastry chefs here is responsible just for making Cronuts. Crazy! I felt bad maxing out on six Cronuts each so I just bought six, giving one to Marcus and bringing the rest to share with my colleagues. I'm part of a "Dessert of the Month Club" at my office with a dozen or so colleagues, so I thought this might be a unique treat to bring in for all the members to try. I am now everyone's new best friend -- they all fell in love with the Cronut, so much that they asked me where they could get more! :P Once I told them about the wait time in line, and how early I got there, they appreciated the gesture even more. 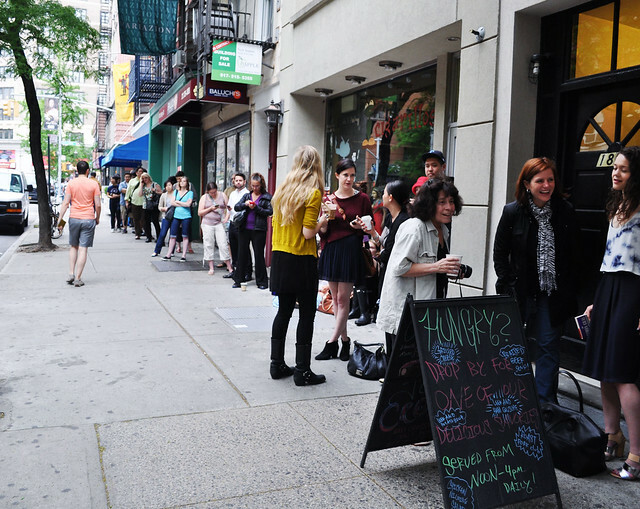 I may even have some fellow Cronut cronies (yup, I went there LOL) that'll be willing to wait in line the next time I queue up at DA Bakery for some Cronuts! For me, the Cronut was unlike anything I'd ever had. They were so unbelievably good that you couldn't even think that a pastry could be this good. Jen, one of my colleagues, said a Cronut is like a medley, one comprised of four different desserts -- obviously a croissant (its dough) and a doughnut (it being deep-fried and its shape) but also a zeppole (its consistency and its dusted sugar) and a Napoleon (and its layered creme ganache) -- singing a beautiful melody all at once. I couldn't have put it better myself. 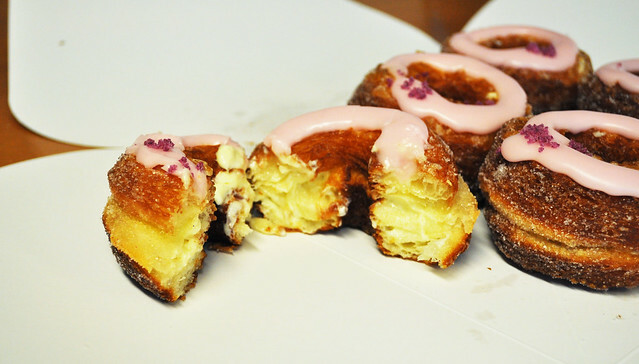 The dusted rose sugar and the rose glaze added a little tartness and subtle floral flavor to the lightly doughy and creamy interior of the Cronut. The best part was when we cut right into it -- you could hear the loose, scrumptious crackle and tell how freshly fried it was that morning. You could taste the buttery layers upon each bite, oozing with a delightful helping of cream. At that very moment, you'll know that the madness that brought you in line to the entrance of this bakery was utterly justified and worth every crazy second of it. Tips for first timers: (1) get there early (an hour before opening time should be sufficient) to guarantee your spot in line, (2) bring something to do while you wait in line, and (3) don't lose hope -- remember, the early bird catches the worm! Price point: $5 for each Cronut. That sounds like a pastry made with this hungry preggo in mind. YUM like WHOA. This place is officially on my agenda when I come home in July (PS I'm coming home in July! Play date?). Haha, I saw something on TV about this a few days ago, and my first thought was whether or not you'd tried it yet. I'm glad you enjoyed it!